Music has had a great influence on my life, beginning when I responded to it as a two-year-old, perhaps more fervently than most toddlers. In the late 2000s, I wrote a one-year blog about my relationship with the music I owned as a child, and I’ve decided to revamp the posts and bring them under the umbrella of my other writing. I hope you enjoy the memoir of my love affair with a bunch of obscure vinyl platters. When I was two years old, I demanded to hear music so often that I drove my parents crazy. They taught me to use the record player to get me off their backs. I asked the name of each record, committed the label to memory, and could thereafter pull a specific song from the pile and carefully drop the needle on the vinyl. The record player had no automatic changer, so I displayed pretty good fine motor skills. I was motivated. My parents’ music collection got me started. They had a bunch of LPs, including The Fabulous Johnny Cash by—well, never mind—and a stereo sound-effects record designed to show off the owner’s new stereophonic sound system. (We didn’t have stereo then.) They had a small pile of 45s, including some Elvis, Patti Page, and the Chordettes. Elvis doesn’t matter to this blog, but the other two 45s have stories I’ll tell later, despite their status as Top 40 hits. My mother’s brother, Tom, bought me 45s at the Big Top department store on Broadway, just a few feet south of the city limits of Gary, Indiana. There, he could buy ten to twenty bargain-bin singles for a dollar. I never got tired of receiving the records, and he seemed never to grow tired of buying them. I wound up with more than 300 45s, most by people you’ve never heard of. I would document all of them in this blog, over time, to keep their obviously sincere artists from oblivion, were it not for the Great Vinyl Meltdown. One day in 1972, I was ordered to put my cardboard box of vinyl on the enclosed back porch. The box sat under a window that allowed direct sunlight to hit the records. Virtually all of the LPs and about two hundred of the singles warped beyond repair. I tossed them, never thinking that I could more easily reacquire the songs at some point if I made a list of the names. Since the mid-1990s, I have been finding the melted songs either on 45s or reissued on CD. The tricky thing about adding them back into my collection was is that I had to remember titles of 45s I had not seen for more than twenty years. I have remembered maybe fifty of the melted titles, and another hundred are locked deep in my memory. Considering that the Meltdown occurred 40 years ago, I’m not too upset with myself. Over the course of the year, I’ll tell a story or two about how I remembered titles I reacquired. My 45s fall into three categories. One is “Ground to Dust,” the 45s I played until the groove was no longer a groove. When I post them to YouTube, I will post listenable versions if they’re available. A second bunch of songs are the Rescued, those I have reacquired since their loss in the Great Meltdown. The third group is the Survivors, songs on 45s that were at the bottom of my box when the Great Meltdown occurred. It’s strange, but many of the Survivors were favorites of mine, and a few were Ground to Dust. You would think all of the best songs would be on top of the pile for easy access, and thus melted, but good 45s must have guardian angels. Since 1972, all of the Survivors are still with me. They have survived my years in college, life in seven different cities, and a couple of pets who might have enjoyed gnawing or scratching the vinyl. And now, a song. This first tune (of at least 100 to come) fits the Ground to Dust category. The 45 survived the Great Vinyl Meltdown, but it was pretty crackly even in 1972. Though my Uncle Tom bought most of my 45s, I’m sure my mom bought “The Gypsy Rover” / “Cotton Fields,” because I remember her singing the song when I was little. It was too big a hit for Uncle Tom to have given it to me. The song is not extremely rare, but its story can be kept short, so it suits my needs today. 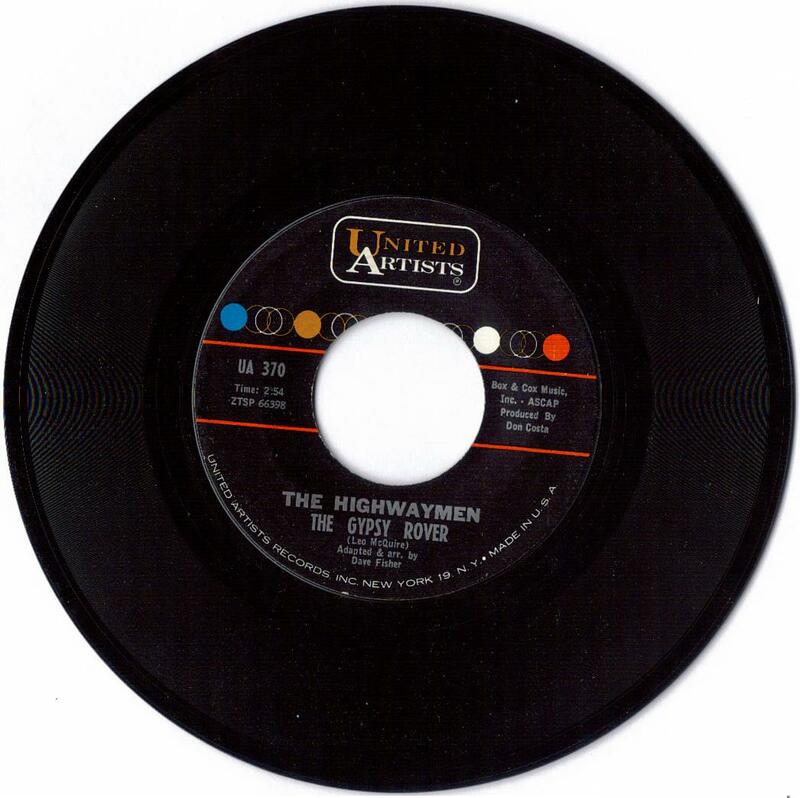 The Highwaymen, college friends at Wesleyan University, rode the crest of the early 1960s folk craze to #1 with “Michael” in 1961. Based on typical music-industry thinking, they were told to follow up that whistling song with another. 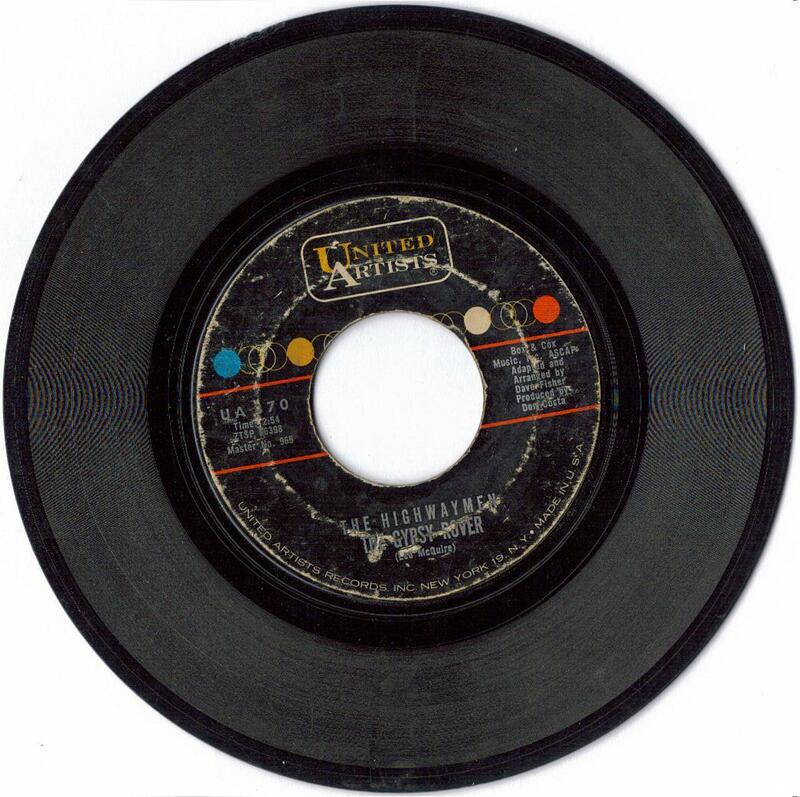 “The Gypsy Rover” (United Artists 370) almost made the Top 40, peaking at #42, but DJs stalled it by playing its intended flip, “Cotton Fields,” which did reach #13 in 1962. Leo Maguire (1903-1985) wrote the song as “The Whistling Gypsy.” He was a singer and Dublin radio broadcaster, one devoted to maintaining the heritage of Irish music. He wrote this song in response to the notion that all Irish ballads end with the death of a lover. The Highwaymen’s version leaves out a couple of verses from the middle of the story, no doubt to keep the song a radio-friendly length. You can find more lyrics here: http://www.mudcat.org/@displaysong.cfm?SongID=2460 and an even longer set of lyrics here: http://ingeb.org/songs/thegypsy.html. The producer of the recording was Don Costa (1925-1983), a major force in 1960s pop. He arranged vocals for Steve Lawrence and Eydie Gorme, produced Paul Anka and Lloyd Price, and became Frank Sinatra’s arranger at Reprise. He got his daughter, Nikka Costa, into the business, and he died when she was ten. She sang with Sinatra, and she still has a substantial music career going. Thirty years after the single’s release, I started asking the manager of Tracks, my favorite record shop in Bloomington, Indiana, to let me know if a Highwaymen compilation ever made it to CD. After several months, she flagged me down and told me their compilation had just arrived in the store. She said she had never expected it. We played “The Gypsy Rover” on the store’s CD player. Despite the charm of 45s, the remastered stereo version of the song was a far superior listening experience. The source of “The Gypsy Rover” is “Michael, Row the Boat Ashore”: The Best of the Highwaymen. United Artists (EMI) 0777-7-96334-2 5. The copyright date of the CD is 1992. I hope you will enjoy this beautiful song and purchase the CD, which is full of cleanly recorded and historic, if somewhat tame, folk recordings. As a side note, I should mention that Willie Nelson, Johnny Cash, Kris Kristofferson and Waylon Jennings released two albums (1985 and 1990) under the name “Highwayman.” Confusion ensued, and a lawsuit brought the Highwaymen and Highwayman together on stage on October 1, 1990 in Los Angeles. The performers on “The Gypsy Rover” are Dave Fisher, Steve Butts, Bob Burnett, Chan Daniels and Steve Trott. As you might expect from energetic college boys, the quintet went on to careers in law, the music industry, and politics. Dave Fisher, who died in 2010, stayed in the music business and wrote more than 1,000 songs. A comment on the labels shown in is in order. You can see, by looking at my original 45 and the replacement I found a couple of years ago, that the typesetting and the information provided varied as additional pressings were ordered. The name of Leo Maguire is misspelled as well. If you look at both scans, you can see that the surface of my original 45 is gray—a sign that the record was Ground to Dust by a multitude of plays. Give the song a listen, and let me know what you think of these guys. Next time, we leave Ireland for Mexico-themed tune. Thanks for reading! Huge music junky and former 45 owner… still have about 300 LPs that I won’t part with. Fun read Sean!